To raise awareness and to help the participants, Param Institute of Education always outreaches and supports various educational & cultural events of community. 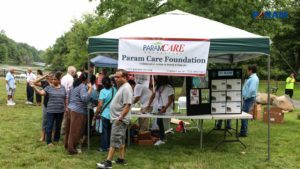 Param Institute of Education (PIE) participated & sponsored annual ‘Summer Picnic’ at Woodland Park, on July 23, 2017, organized by Indo-American Seniors Association of Clifton. Dedicated faculty member of PIE explained about the benefits of vocational courses. The large number of people including the youths visited the Booth PIE and inquired about the program and thanked the staff for providing very useful carrier related knowledge. It was a fun packed events with foods & fun, games, garba, and music the large number of people including the youths & seniors participated in the whole day event.